Good Way’s intelligent home solution includes a reliable home gateway and different creative controllers to create a user-friendly ecosystem which can be controlled by smartphone app., remote control of Set-Top-Box, and voice assistants at home or anywhere and is interoperable to add other smart sensors and controllers from other brands. Good Way’s intelligent home solution is available for Android Set-Top-Box and Smartphone. Easy-to-use gateway and USB dongle are interoperable with different smart home sensors and controllers, which can assist system integrators and distributors to avoid compatible issues and unnecessary RMA cost. Good Way’s intelligent home solution is easy to set up different scenes, user-friendly to control different home activities via home gateway or USB dongle, create colorful light effects by R.G.B.W LED dimmer, automatically control motorized window curtain by roller shutter controller, and monitor power consumption of connected home appliances connected by smart switch and in-wall power monitor switch anywhere by smartphone apps, voice assistants such as Amazon Echo (Alexa), Google Home, or different smart speakers, intercoms, gateways or remote control of set-top-box plugged by USB dongle. Good Way’s intelligent home solution is stable and flexibly customized to meet different smart home application demands and help our customers release time-to-market products. 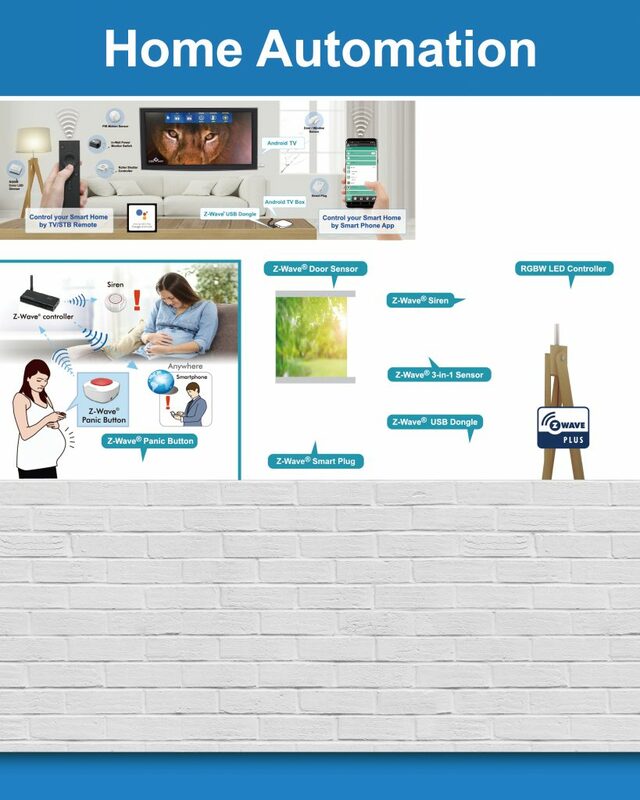 Good Way’s intelligent home solution can be treated as a set of value-added smart home kit to assist our customers to enter smart home market and differentiate from their competitors. Good Way’s innovative gateway and unique USB dongle enable users to upgrade their current Linux/Android gateways, tablets, smart speakers, intercoms, Set-Top-Boxes, OTT boxes to support home automation ecosystem by TCP or http connection of gateway or software integration of USB dongle.